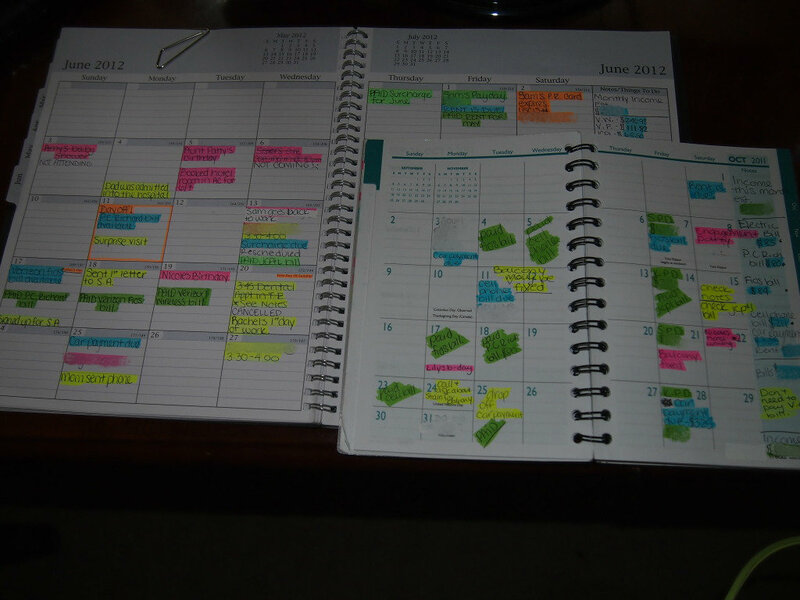 Can you believe it’s been FOUR years since I blogged about my monthly planner and how I keep all my bills and events organized in one place? I noticed recently that it’s getting a lot of hits on Pinterest and I thought I’d post about how I’m keeping my planner now. Currently, I’m using highlighters and small post-it notes to keep everything together. I’m not sure where to start, so I guess we’ll go from left to right. On the border on the top left I use pink post-its with blog post ideas that I may want to blog about that month. Then, once I blog about one of those ideas, I move the post-it to the day that I posted the blog, which isn’t necessary but is helpful in case you want to go back to previous months and look at what you’ve done. On the bottom left margin I use these pale yellow (or as I like to call them, smoker’s teeth yellow) post-its with things that I HAVE TO get done during the month. And yes, I moved to PA from NJ back in May and I still have not gone to the DMV to get my license plates transferred. I just REALLY hate the DMV! Anyways, once I get an oil change or get my license plates registered, I’ll move that post-it to the day that I did it. In my planner, I write when a bill is due. Since we moved, we’ve got a lot of credit card bills to pay off. So for example, I write down on the 4th that my Home Depot credit card bill is due, then under that I put what the balance is that I still owe. Then under that I write “New Balance” so on the 4th when I pay that bill, I write what the new balance is after making the payment. Then I take that new balance and put it on the next months post-it under “Still Owe”. This makes it easier to know where you’re at with each of your outstanding credit cards without having to look each one up online. As for our other bills, like the mortgage, car payments, electric, etc., I just write down on the day that I pay them and then cross them off. I also highlight it in green, or in my case I highlight it in yellow and blue because I don’t have a green highlighter – haha! I use these teal colored post-its for any kind of photo sessions I might have. 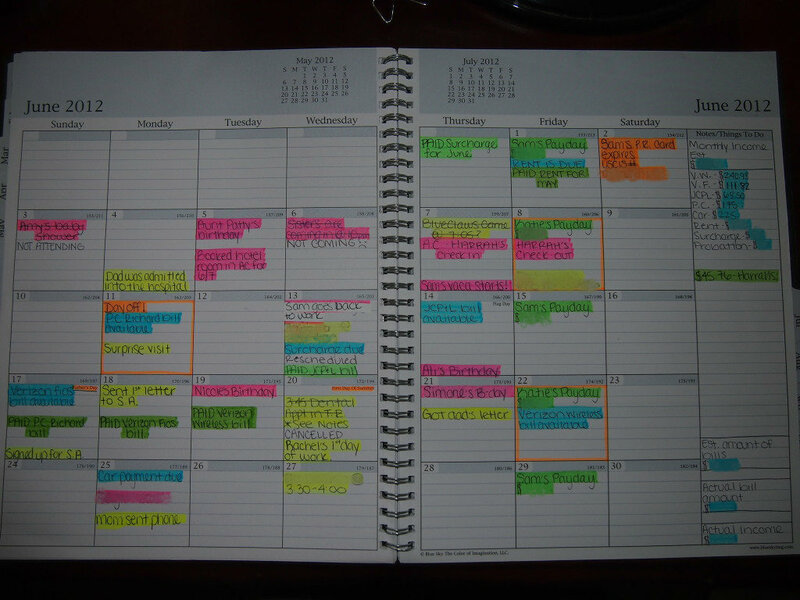 I would just write that appointment in my planner but since moving to Easton, I have not required clients to pay a deposit to hold the appointment, so the appointment days change a lot. With the appointment being on a post-it, I can just move the post-it to any day they may change it to. It keeps my planner pretty so I don’t have to scratch out anything. I use the bright pink post-its for fun events like birthday parties, people coming into town, events in the community, etc. Btw, you can get these convenient post-its on Amazon and they’re super cheap. Pick them up here. And that’s about it. I feel like my monthly planner has become a lot more efficient in the last four years and I hope it helps make your monthly planner more efficient as well! If you’re like me, you like to stay on top of the monthly bills. Making sure that they’re paid on time is very important. I’ve come up with a great way to remind myself when all the bills are available to pay online and keeping track of when I actually pay them. If you’re the bill payer in your household, listen up! You need this! I spent about $10 on these monthly planners and they’re a life saver. I started out with the small green one. It was really easy to just carry around in my purse for quick reference and then I’d keep the bigger one at home, but I ended up just sticking with the bigger planner. A lot more room to keep things looking pretty and organized and it still fits in my purse. As you can see the smaller one looks a mess! 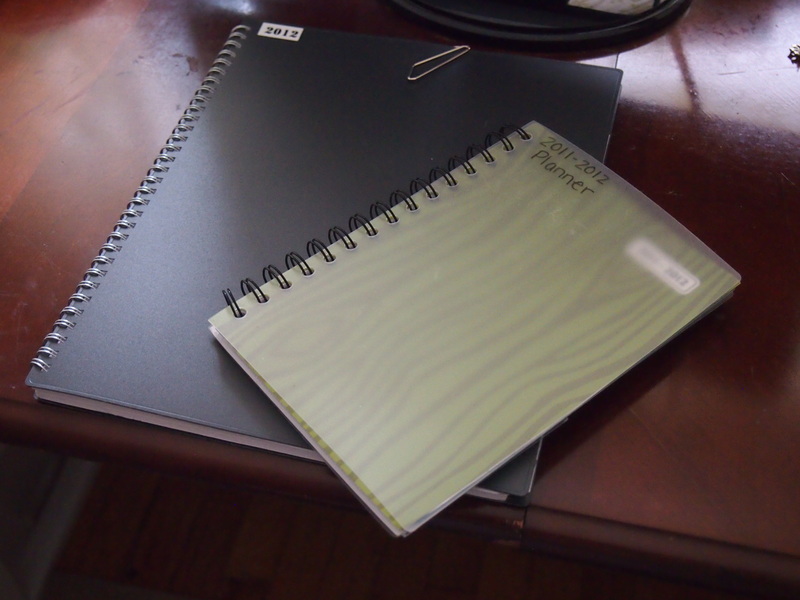 So if you’re going to purchase a planner, just go for the bigger ones. Totally worth it! I had to blur some information out of the pictures due to private information, but you get the idea. I use 5 different highlighters to determine what is what. Blue – Bills that are due or available to pay online, estimated monthly income, and estimated monthly expenses. Green – Bills that I have paid and paycheck amounts on Fridays. Yellow – Information that I need to remember. Pink – For special occasions or fun events coming up. Orange – My days off and important information that pertains to my husband. First, you need to determine if you’re going to have your bills mailed to your house or if you’re going to print them out at home. I get my bills mailed to my house (I know, tree killer!) but I pay almost all of my bills online. I record what days the bill is available to pay online in my planner and highlight them in blue. That doesn’t always mean that I’ll pay it on that day but at least I know where to go and what to look for when I’m ready to sit down and get to business. After I have paid a certain bill I’ll write it in the appropriate space and highlight it in green. I don’t have a fixed weekly income since I work part time and don’t get paid for holidays, so I like to keep track of my paycheck amounts on Fridays which I also highlight in green. If something happened or I got information that I needed to remember I record it in the planner and highlight in yellow. The information that I’m talking about is usually if I got an oil change I like to remember the day and the amount of miles until I need to change it again. If I received something in the mail that I need to return in a certain number of days. If I subscribed to something and I need to cancel my subscription before a certain date before I’m charged again, like Netflix and my Amazon Prime Account (You’re great Amazon, but I’m not interested. Sorry). Or to help me remember a doctor’s appointment. Pink is my favorite highlighter color in my planner because it means it’s either someone’s birthday or a special occasion. And I use orange to mark the days that I have off, called out of work, or holidays. I work part time but I get every other Friday off so it’s very easy for me to just look in my planner and plan around my days off. Also, if you notice on the right side of the planner I have a list of the bills that I pay monthly. When I find out the exact amount of the bill, I write it on the side and highlight it in blue. It makes my financial spreadsheet very easy to put together, and I’ll show you how to do it soon too! This planner has really saved me from forgetting to pay a bill, missing a doctors appointment, and also has saved me from forgetting a loved one’s birthday. I would definitely recommend that everyone have something like this. A lot of people have similar reminders on their phones and laptops but I really like having an actual planner to jot stuff down in. Hope you enjoy this project! Stay tuned for the next project! IF YOU THOUGHT THIS WAS HELPFUL, GO CHECK OUT MY UPDATED MONTHLY PLANNER POST!